You know how it happens in genealogy - one thing leads to another and then it avalanches. With the aid of the internet it happens much more quickly these days. And so my Sisson tale begins. The other day I was contacted by my colleague, David Martin, a genealogist with the Genealogical Society of Cape Cod. He knows I'm a house historian and had read my post on Westport, Massachusetts House Histories. He wanted to know if I knew anything about a house in Westport that was built by one of his Sisson ancestors. I didn't know anything about the house unfortunately but I did reply back to tell him that I am also a Sisson. I also had to admit to him that I had never researched the Sisson family. The funny thing about my New England lines is that they are so far back that I don't bother researching them. I know, ridiculous you are saying. Most people would jump to have those old lines. I guess my New York ancestors just keep me distracted! The first Sisson immigrant was Richard Sisson who came over to America by 1650 and settled in Rhode Island. David tells me there's a very good Sisson book called The Descendants of Richard and Mary Sisson by David and Joan Sisson. My most recent Sisson ancestor is Phebe Sisson (born 1774 - died 1841) who married David Albro, Jr. Phebe was the daughter of George Sisson, Jr.
Not long after discussing the Sissons with David, I was contacted by Lisa Saunders, another Sisson descendant. She directed me to a blog post she wrote recently about a serendipitous moment of discovering some Sisson Ancestors in "Is Captain Sisson Reaching Out From Beyond the Grave?" 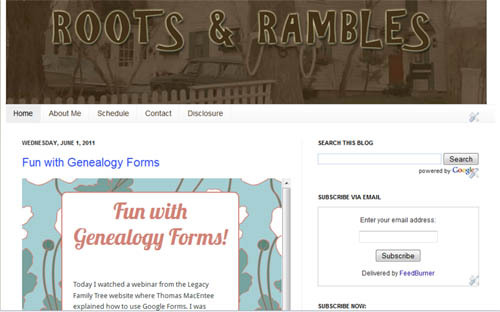 Check out her blog post even if you're not a Sisson and especially if you love serendipity in genealogy. 2) A Sisson Family Reunion is held every two years in different locations. This is more of a research conference for Sisson researchers than strictly a descendants reunion. The next one will be held in Albany, New York, June 21-23, 2012. 3) The Sissons are also arranging a research trip to England in September 2011 to further trace the ancestry of immigrant Richard Sisson. It is being coordinated Susan Ashley Blake, a Sisson in England. If you might be interested in participating in that trip send me a line and I will put you in contact with her and others participating in the trip. I would love to add my house history angle to the Sisson family research. If anyone knows of existing Sisson family homes please let me know where they are. It would be fun to do a little research on them. I love the concept of intentionally leaving breadcrumbs for our descendants to find. I especially love the kind of breadcrumbs that help the present as well as serve as a clue for the future. How many of you have received a flyer or email about buying a brick? Maybe you tossed it in the trash and didn't give it much thought. Next time you receive a flyer to support a fundraiser for a local charity, take a second look. A park in my town was raising money for improvements. They decided to sell engraved bricks to raise funds. 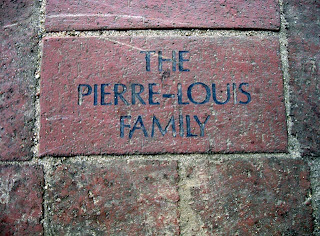 The donors could have whatever they wanted put on the bricks. 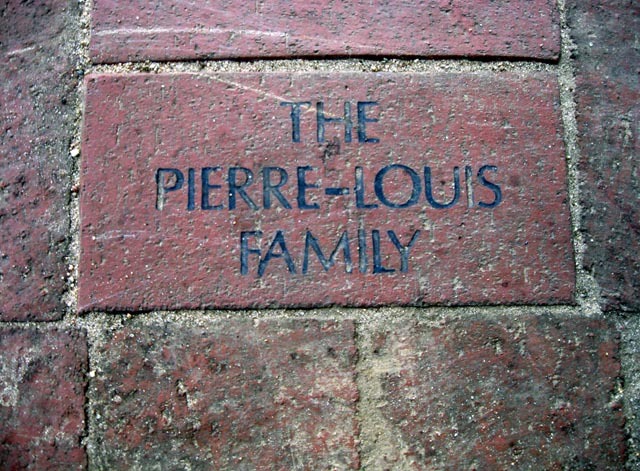 I chose a very simple "The Pierre-Louis Family." Wouldn't it be fun if generations from now my descendants discovered where I lived in census records or city directories and then decided to take a ride and visit the town? If they happen to stop in the park they will find our family legacy. It's fun and feels good to know that I am helping the park where my children play right now and that I'm also getting something back in return - a little monument to the future. The next time you get a chance to buy a brick for a fundraiser - do it! Leave a legacy behind etched in stone. These are the top five books on my bookshelf in terms of usage. They are the ones I most frequently reach for. That kind of restricts the list to work-related reference books. Not surprisingly, they have a heavy New England bent. 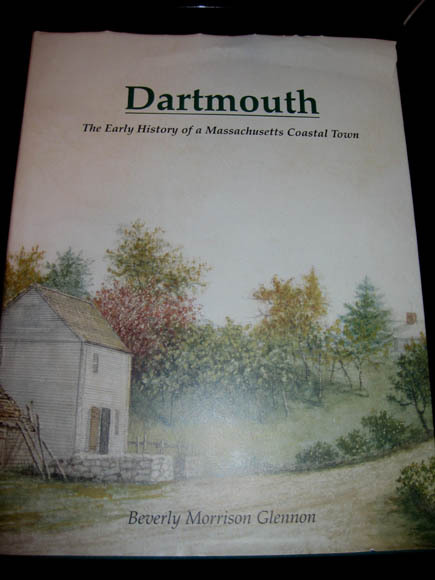 I use this book mostly for checking town and county incorporation dates in New England. But when I step out of New England in my research, I use this book as a primer to get a sense of the lay of the land in other states. This book is a really handy reference for New England. The courts can be tricky to understand and even harder to remember the particulars of each county. This book makes it so I don't have to. And the list of repositories and their court records is priceless. This book is just so handy. There is no one who can keep everything in their head. This is the go-to book of where and when in New England. My only issue is that the book is out of date and should really be revised. Let's hope that happens some day. 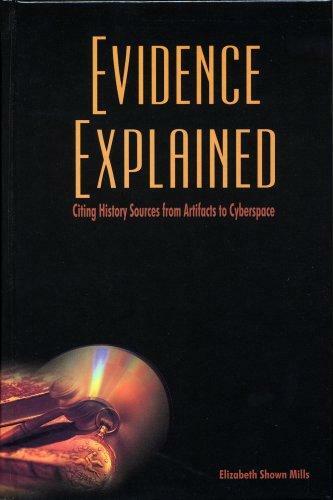 I use this book every time I write a report or any document that includes citations. Random bookmarks appear throughout for things I refer to frequently. I have also printed out clarifications that Mills has posted on the TGF or APG list and inserted those into the book as well. What are the Top 5 on your bookshelf? On the face of it, Father's Day is a happy, joyous occasion. Hallmark prints millions of sentimental and funny cards to celebrate the day. Young children glow as they give cards and presents to their fathers. And those who lost their father's long ago wax sentimental about the wonderful father no longer in their life. But for many, Father's Day is a challenging day. For those who have lost their father recently the pain is still too strong to be light-hearted. Some people never had a dad and this day serves to remind them of what they never had. Others watched their dad abandon them, never to be seen again. And still more simply have a complex, difficult relationship with their fathers. I grew up in a home with a single parent. I seem to recall my father moving out when I was about five. The divorce, court dates and battles went on for much of my childhood. Being a child of divorced parents can be very confusing. Children can't understand the complexities of grown up problems. That often leads to taking sides. When I was in high school I chose to not see my father for an entire year, not even on Father's Day. My father was very hurt by that. I was a stubborn teenager who thought it was time to assert my independence and control of relationships. I relented after that year but our relationship was still strained. Later when I started college and lived away from home, I decided it was time to start fresh with my Dad. I invited him to engage in some honest dialogue and he reciprocated. For the first time I was able to look back on the past with an adult mind. I was able to logically sort through all the memories and separate the fact from fiction. From the conversations with my Dad, I learned that no one is perfect. I don't mean that to sound flip. As children we grow up with the illusion that our parents are without faults. As our new relationship, our adult relationship, developed, I learned forgiveness. I don't mean that easy "I forgive you" that lightly falls from the lips. I mean that raw, honest forgiveness that only comes from deep within the soul. Today, my Dad and I can talk about more mundane things like gardening and grandchildren. The deeper conversations have been relegated to the past. We can celebrate our hard work with lighthearted banter and gently nudging debates about family history. For me, Father's Day is truly a day of forgiveness. A day to celebrate second chances. I'm grateful that my dad and I had a chance to re-define and re-create our relationship, to forgive each other and to move forward in a meaningful, positive way. It's never too late for second chances. It's never too late to extend your hand. Keep your mind open and your expectations to a minimum. Reach out and offer to dialogue. Your request just might be reciprocated. I think a lot of times people aren't really sure what I do and who I do it for. So I thought I would put it out there so you could understand my research focus better. That means that nearly everything I do has to do with one of those three states. Within that, I have three main research interests - house histories, African American history/genealogy and 17th & 18th gravestones. My interest in those three categories is restricted to New England, though I do background reading beyond those borders to expand my understanding of the topics. The ultimate project for me involves an old house where an African American lived and has a gravestone nearby. I was lucky enough to do a project like that this year. Not too many of those come around. Professionally I call myself a house historian. It might be more accurate to call me an historical researcher who is a house historian, genealogist, local historian, speaker and writer. I take paid clients who want the history of their houses researched. I will be doing less of this in the future as I spend more of my time focusing on writing. I also take genealogical research projects that specifically focus on probate, deed, tax record or town record book research. I do not take genealogical research projects in the sense that I will not trace anyone's genealogy. I will take genealogy projects for folks who need to answer specific questions that fall within the realm mentioned and know exactly what they are looking for. I will also do antique provenance research and background research for books and films. Lastly, I do public speaking for a fee. My topics run the gamut of my interests. Typically half of the talks I give are house history talks and the other are genealogical talks on a wide variety of topics. I don't make much doing public speaking. It mostly covers my expenses. 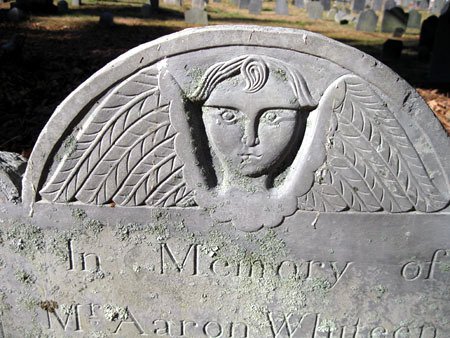 I photograph 17th and 18th century gravestones every chance I get. If I find myself in a new town I get my camera out and see what I can find. Living in New England there is no shortage of historic cemeteries. My main motivation is to preserve the gravestones for future generations because the weather and acid rain are slowly destroying these historic stones. But I also really enjoy learning about the carvers and the art and being able to make connections between them. I will always be amazed how walking through an old cemetery is like coming face to face with generations of a town's early citizens. I don't like new cemeteries. I steer clear of those. In my mind new cemeteries are about death and old cemeteries are about history. I stick with history! I photograph old houses and walk through them any chance I get. My camera is at the ready all the time to photograph houses that are about to fall down, be torn down, have beautiful architecture or are "naked" because they are under reconstruction or rehabilitation. I particularly love naked houses because they allow me to see what the house looked liked when it was originally constructed and the changes that have been made to it. I also research my own family history for fun. I don't get to do this all that much but I am trying to do more of it lately. Most of my ancestors come from New York or Pennsylvania. It's not easy for me to do onsite research in either of those locations because of the distance but I imagine as my kids get older it will be easier to do that. I'm also interested in finding ways to make family history fun so that more members of my family can become interested in learning their family history. 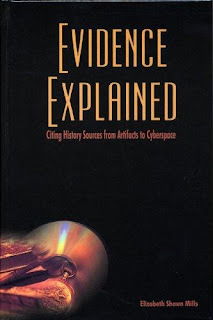 I keep a few research projects on the back burner constantly simmering along. Mostly these are projects involving African Americans in New England. I'm trying to learn as much as possible about the early history of African Americans in New England because I feel it is a topic that has been too long overlooked. Lastly, I like to meet other genealogists, local historians, historic house nuts and preservationists. I like to go to meetings and conferences and learn from other people and get excited by their shared passion for history. I love to go to talks about stuff that has nothing to do with the things I research. I find it relaxing and it broadens my knowledge. I also like to blog, meet genealogists across the country and the world through Facebook and Twitter and generally keep up with everything that is happening in the genealogical community. I think that pretty much sums up what I do. I hope I'm not forgetting anything. If you have any questions or your curiosity is piqued, leave a comment or send me an email. Or just let me know that you are interested in the same things that I am. It's fun to meet people with the same interests. It's kind of a joke in my family, at least for us kids. We'll say something like "this grandson is really good at skipping stones" and my father will inevitably say, "he must get that from me!" As we are researching our ancestors it's fun to make a discovery that one of them may have had similar interests or avocations that we have. Maybe you're an artist and you discover that your ancestor was too. Or maybe you have a long line of teachers in your family. Certain traits and passions seem to carry through the generations. If you could leave a note for your descendants, which traits would you tell them about yourself? Leave a comment below or write a post on your own blog. I don't know who you are but here are some of the things you might have gotten from me. I love spicy food. I like it spicy enough for my face and my nose to turn all red and sometimes, if it's the right kind of heat, for the tears to come streaming down my face. But I don't like Vindaloo - that's too hot. I have my limits. I love thunderstorms. When I was a kid, my brother and I would either stand on the front steps or hang in the garage with the door open just to see the storm. We would only retreat inside behind a screen or storm door when it became too wet or windy. My mother loved thunderstorms too. 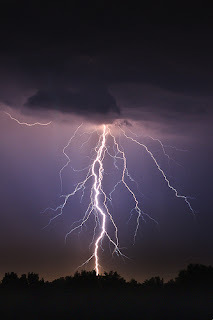 If you are a storm chaser maybe you got that from us. I like observing nature. I know that sounds a bit hokey. I say observing just so you'll know that I'm not really into camping or outdoor sports (except hiking which I do love) and being out in nature all the time. But I love watching birds, watching the seasons change, seeing the flowers and trees grow each year, identifying wild flowers in the woods, looking for animal tracks in the mud and snow and spotting clues to the past like finding old stone walls in the woods. If you, my great, great grandchild, have any of these traits then you probably got them from me! Photo Credit: Photo by Leszek.Leszczynski used under the creative commons license. Yesterday I found myself at the Essex Registry of Deeds in Salem, Massachusetts. I had to pause and think hard before I made the trip. You see, I had a choice. I could drive all the way to Salem and look at the books or I could hop on a train and visit the New England Historic Genealogical Society (NEHGS) in Boston which has all the early deeds and indexes on microfilm. The advantage of going to NEHGS is that all the microfilm is available in one room with knowledgeable staff ready to help me. Another big advantage is that I can save the images to my thumb drive and bring them home to store on my own computer. 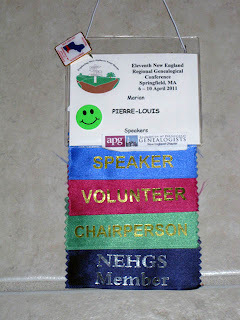 In addition, I can get other research done because NEHGS has so much more than just deeds. The disadvantage is that I don't really like using microfilm. It's time consuming pulling the rolls one by one, reeling through them, moving to another station to save the images. And I'm always so worried that if I'm not extra gentle that I might tear one of the films. It's just slow. 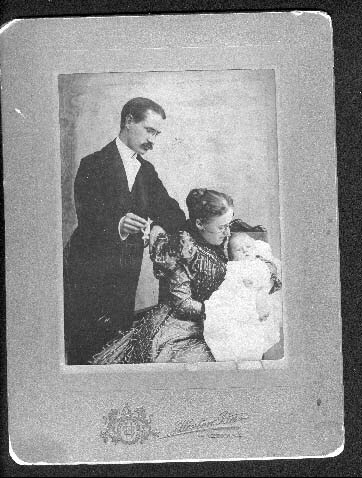 And not to mention that sometimes the microfilm images just aren't as clear as what is available from the books. And the advantage of being able to research so many other things at NEHGS can be a real disadvantage if you need to focus on one thing. The temptation is too strong! I opted for a two tier plan of action. I decided to go to the Registry building and do my deed research. It is so much faster pulling books off shelves, flipping through them and then re-shelving. Because of the way the Essex Registry is set up I can rest my books for viewing in the same row where I am searching which makes wheeling around and pulling multiple books very easy. For the second part of my plan I decided to save NEHGS for later in the week. That way if I didn't finish my deed research I could always do it there. At the same time, I could move on to probate research. It's not really about deed books. I have been using microfilm for many things lately, pulling obituaries from newspapers and checking town records. But somehow I still prefer the option of using books whenever I can. What about you? 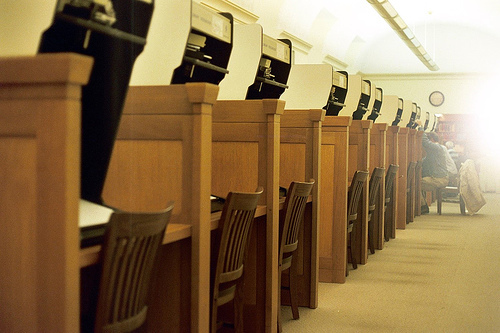 Are you a book or microfilm person and why? Photo Credit: Photo by Plutor used under the creative commons license. Many Americans can trace their roots back to "Old Newbury", a region located in northeastern Massachusetts. Today Old Newbury is comprised of the towns of Newbury, West Newbury, and Newburyport. Newbury was founded in 1635 and the many founding fathers include familiar names such as Lunt, Noyes, Dummer, Jaques, Little, Coffin, Follansbee, March, Richardson, Morse, Woodman, Swett and many others. I am not an expert on Old Newbury but I have had the pleasure of working on a Newbury research project for the past six months. The history of the area, combined with its beautiful architecture and inspiring scenery, make it a perfect place for a summer research trip. If you decide to come this way for a visit be sure to put the Newburyport Archival Center, located at the Newburyport Public Library, at the top of your research list. Hidden in the basement of the library, the Archival Center contains rich resources for Newbury and surrounding areas. They maintain a large selection of families histories for local families. I was particularly impressed to see a number of additional, more recent family manuscripts donated by current genealogists providing updated family history information. There is a large selection of published histories, vital records, indexes for probate and deeds and, for the house historian in me, a selection of Newbury area architectural books and house surveys. They maintain a collection of microfilm and maps too. Computers are available in the archival center to access databases such as Ancestry.com and AmericanAncestors.org and microfilm readers are there too. You will be asked to stow most of your belongings in lockers in the hallway and to leave your pens behind. Plenty of pre-sharpened pencils sit atop each table. Photocopies are a very modest 15 cents each. Parking is available in a small municipal across the street from the library (expect to pay 50 cents per hour to the meters). The very knowledgeable and helpful archivist, Jessica Gill, is a pleasure to work with. My recommendation, if researching in this part of Massachusetts, would be to stop by the Newburyport Archival Center first. Then, if you can't find something you are looking for, try other locations. You will be amazed at just how much research you'll be able to get done in one place. Thanks to my friend, author Marge Armstrong, for introducing me to such a wonderful resource. Will I ever get used to the anonymity of Blogging? A funny thing happened this morning. It's not the first time but it just hit home for me today. I became Facebook friends with a fellow APG member. She sent me an email and let me know that she had read posts from my New England House Historian blog. Until she said that I had no idea she even knew I had a blog. There's something so strangely anonymous about writing a blog. I'm sure that people who write books must feel the same way. The thought that you can write something, put thoughts out there in the world, and have no idea who is reading is just so vague! It's true that we do get feedback when people leave us comments. That's wonderful! And it's also true that it's not important who is reading your blog. I guess it's just a little funny that people can get to know you but you're not getting to know them at the same time. I'm not complaining or wanting to change anything. I'm reflecting on the reality of it. I guess there is a certain role or responsibility that goes along with being a writer who publicly shares their writing. I would love to encourage everyone to keep reading even if they never leave me a blog comment. 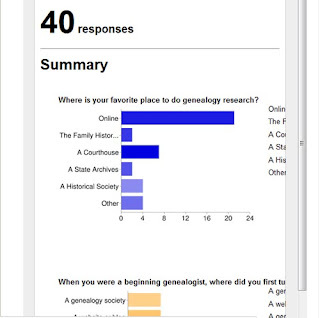 If I can encourage people to become interested in researching the history of houses or in learning more about genealogy then that is enough for me. I'm simply writing to share my passions about what I love and I hope that it becomes infectious for a few other folks. Though I would love to hear from other bloggers about how they feel or cope with the anonymity of writing. And even from readers about their take on it. Thank you, Thomas MacEntee, for a brilliant idea to show the true face of genealogy! My great grandparents, Seeber and Sarah Edwards with my grandfather c. 1897. So you're researching your family history. You're probably also trying to become a better genealogist along the way so that you can find your ancestors easier. Maybe you're even reading genealogical magazines and journals to help broaden your knowledge. There are lots of great genealogy magazines out there such as Family Chronicle, Internet Genealogy, Family Tree Magazine and American Ancestors. 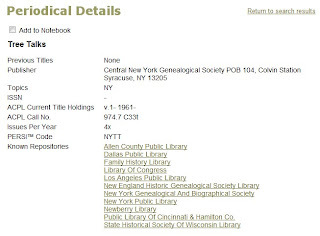 There are also many peer reviewed journals such as the National Genealogical Society Quarterly, the New England Historical and Genealogical Register and the New York Genealogical and Biographical Record. All of these journals and magazines are great but are they the right publications for you to use in researching your family history? Yesterday, I wrote about my New York Brick Walls. In it I promised myself to find out everything about Pompey, NY in order to help solve one of my brick walls. How would you go about starting this research challenge? I turned to PERSI - the Periodical Source Index. 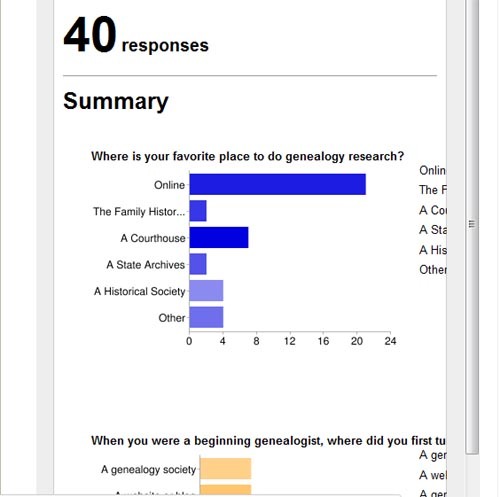 PERSI gives genealogists a view of what has been published in genealogical and historical publications. It allows us to search by places, people, publications and how-to's. What better place for me to start searching about Pompey, NY than the PERSI places index. 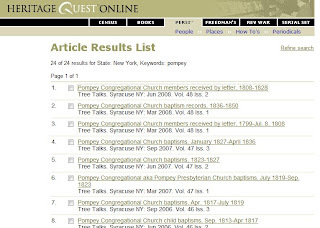 One thing I discovered about Pompey, New York is that most of the articles published about it have been in a quarterly called Tree Talks which is published by the Central New York Genealogical Society. 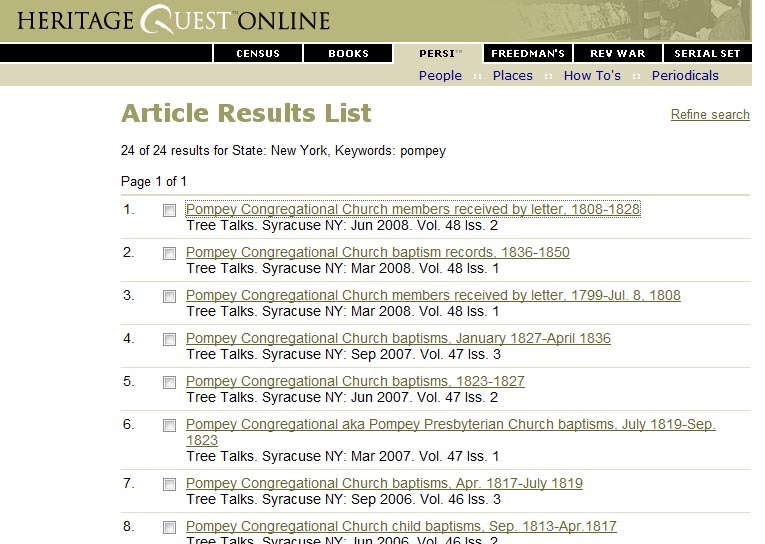 Tree Talks is not something I have easy access to so how am I going to find copies of the publication? By clicking on the Tree Talks link in PERSI, a list of known repositories appears. 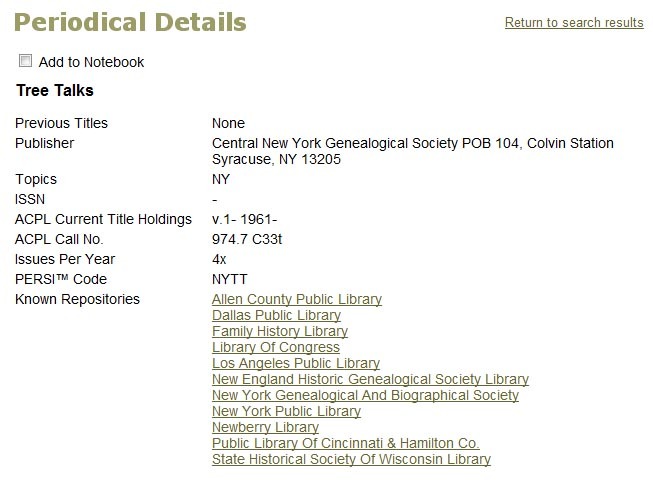 I can see from the list that the closest repository to me is the New England Historic Genealogical Society. If you can't travel to one of the repositories listed it is very likely that one of them has a copy service that can provide a copy of the article for you. Not all of the articles about Pompey are in Tree Talks so it's going to be important for me to check out the other articles as well. If you're not yet familiar with PERSI, the first thing you need to know is how to gain access to it. 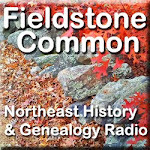 PERSI is available on Ancestry.com and HeritageQuest (which is available through many local libraries). For more detailed information on using PERSI check the FamilySearch Wiki. Lately I have switched from conference organization and speaking mode to deep-research mode. While both are fun, let me tell you it feels good to get lost in research for awhile. I've been traveling all over the state of Massachusetts visiting Registry of Deeds, Probate Courts, libraries, cemeteries and whatever else I can find for my house history research. I have been particularly lucky to have visited the New England Historic Genealogical Society (NEHGS) several times in the last few weeks. NEHGS is an exciting place to research because they have so many resources that span many geographic locations. For the first time in a long time I actually got some research done on my own family thanks to NEHGS. Many of my ancestors come from New York, a place I can't get to very often. Luckily NEHGS has New York records available that I can't easily get access to. It seems that my visits to NEHGS have really got me considering my own family history again. I've been so inspired that I'm going to attempt to tackle two of my biggest brick walls. Brick wall #1 is my immigrant ancestor William Edwards. William came to America some time before the Revolutionary War from Wales so the story goes. He is said (according to a DAR application) to have served as a patriot in the Revolution but I've never seen any conclusive evidence that separates him from others also named William Edwards. I have no birth, marriage or death records for him. I do however, have baptism records for his first three children, Elizabeth Edwards (born on 6 Apr 1788), William Edwards (born Oct 1789) and my ancestor John Edwards (born 6 Jan 1792). All three were born in Germantown, New York. William appears in the 1800 US Federal Census in Charleston, NY but not in 1810. More children were born in Montgomery County New York with the last one being born in 1808. Did William die before 1810 and is that why there is no further trace of him? There is so much information about his eight children, yet there is virtually no oral history passed down about him or his wife, Christina. Why is that? Did William arrive in America alone or with other family? My research strategy, given the sparsity of information about William is going to be to focus on his children. I will attempt to hunt down every bit of information, including migration patterns and fans (friends, associates and neighbors) in my attempt to find clues about William. I anticipate this will be a long, slow process. Brick Wall #2 is my great, great grandmother, Charlotte (Hill) Learned. There is a very old Learned family Bible that provides marriage and death dates for Charlotte who married William Chandler Learned in 1855. Charlotte had two daughters before she died in 1862. While I have a death date and location for her I have yet to discover where she is buried. I believe Charlotte to be the daughter of Orange Hill of Pompey, Onondaga County, New York. There is quite a bit of information about the Hill family but I have found nothing to link Charlotte to her father. The Hills came from Massachusetts a few generations earlier and I'd like to be able to link her to them conclusively. When was Charlotte Hill born and where? Is there a document or enough indirect evidence that proves her connection to her father, Orange Hill? My research strategy with this brick wall is going to be focused on location-based research. I will learn everything I can about Pompey, NY. In addition I will try to track down every document possible associated with the Hill family in Pompey for three generations back from Charlotte in an attempt to prove the connection between Charlotte and the Hill family. If I'm lucky, perhaps her grandfather left a will that makes mention of her. I'm excited about researching my own family for a change. It's going to be fun to try to chip away at these brick walls. Hopefully it will take me into some uncharted territory. I imagine my quest for Charlotte Hill's father is going to be easier than my search for William Edwards. I'll share thoughts on my research process on my blog along the way. Yesterday I created a blog post with an embedded form from Google Docs. Here are some of my first reactions to using Google Forms in Blogs. Embedding the form into Blogger was easy. I simply copied the code from Google Docs and pasted it under the Edit HTML tab in Blogger. Depending on the number of columns you have in your blog design you will have to reduce the width of your Google Form considerably. That's fine but it means your readers will have to scroll so keep that in mind. I reduced my width to 500 to fit the text area of my blog. The blog was a bit slower to load with the form in the blog post. The blog post with Google Forms displayed well in Google Reader and even let me respond to the questions in Reader. I liked that. Because of the set width restraint there was a lot of empty white space to the right of the blog post because Reader has a wider format. Unfortunately, the embedded form did not display at all in the emailed version of the blog post. After completing the questions Blogger did not automatically take the readers to the top of the page for the thank you/confirmation message and link to the responses. If they didn't scroll up, which I'm sure many didn't, they won't realize the content is available to them. I opened up the answers to all readers so that I could see how it displayed. The restriction on the width made this difficult to read. There is no left/right scroll bar to see the text that is out of view. I can see that it would have displayed really nicely if it had more room to spread out. The colored graphs are a nice touch. For paragraphs answers it displays the first few and then ... but you can't click on the ... to see more. The text answers are in a funky shade of gray highlight to separate them. Perhaps they could have left the highlighting off and just used commas. The results display - notice the cut off text to the right. The form blog did not feed out to networked blogs automatically. I can't say for sure if that was a fluke or if it is was because of the form. But that is definitely something to keep an eye on. One user commented to me (thanks Sharon!) that if you hit enter in response to the question it will submit the form. That can force readers into having to take the questionnaire twice. It would be nice if Google could get rid of that and just rely on the Submit button on the bottom. 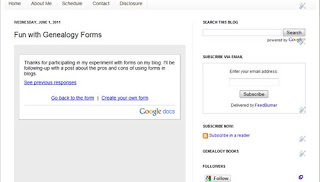 Google Forms are a function of Google Docs which is available when you sign up for a free Google Account. I learned about using Google Forms by watching Thomas MacEntee's webinar on the topic. The webinar will be available for viewing for the next 10 days on the Legacy Family Tree website.